There’s Christmas. There’s Easter. There’s Thanksgiving. However, none of those days, for those of us who grew up in Gimli, Manitoba, are as important as the first weekend in August. That’s when the holiday with the unpronounceable name, Islendingadagurinn happens. Part of the charm of this celebration has been its wickedly long Icelandic name. An Icelandic Celebration, an Icelandic Festival, a Gimli Pickerel Party don’t have the same cachet. I mean, how do you beat answering the question what are you doing on the long weekend with “I’m going to Islendingadagurinn.”? This year is going to be the 125th anniversary of Islendingadagurinn. My great grandfather went to Islendingadagurinn, my grandfather went to Islendingadagurinn, my father went to Islendingadagurinn and I went to Islendingadagurinn. Not calling this celebration Islendingadagurinn is like sawing the horns off the Viking statue that stands on guard over Gimli. His helmet may not be authentic because of the horns but so what, no real Vikings landed on the shores of Lake Winnipeg in 1875. Our ancestors did. They were sheep farmers, fishermen, indentured servants, people driven out of Iceland by weather, politics and poverty. However, a statue of a sheep farmer doesn’t have the same impact as a Viking with a horned helmet. If the Viking had any sense of branding they’d have put horns on their helmets. Gimli, when I grew up there in the 1940s and 1950s, was Icelandic to the core. Yes, there were other ethnic groups represented: Ukrainian, German, Polish, Aboriginal, Scots, English, Irish, the odd Dane but the town was Icelandic. They dominated the local politics. They dominated the business community. They were the social elite. Even small Manitoba towns have social elites. Icelandic was spoken in stores, in church, in homes. The Viking with horns hadn’t been built yet. He wasn’t yet needed to remind us of who we were. In the 40s, Islendingadagurinn was mostly a family affair. It was mostly about those local people who had moved away, coming back to touch base with coffee and kleiner and vinarterta. And mom and dad and brothers and sisters and uncles and aunts and cousins. People of Icelandic descent are big on family relationships. They can drink four pots of coffee while discussing how they’re all related to everyone else at the kitchen table. Islendingadagurinn grew. People used to come down on the train, then cars became more available and people drove from near and far. Like from Winnipeg and Brandon and even Edmonton and Calgary. They came from other small communities in Manitoba’s Interlake. The parade which, at first, was some cars decorated with colored ribbon and signs announcing local politicians as passengers added the Shriners. The Shriners brought color, music, entertainment, turned the parade into a spectacle worthy of a city instead of a small Manitoba town. That, in turn, attracted bigger and better floats. The parade now is an event not to be missed. As more people came to share in the Icelandic experience, more events needed to be created for them. The visitors were no longer just relatives enjoying a visit and a beer. There were the usual races, the speeches by the Fjallkona (the queen of the mountain), by distinguished visitors from Iceland but when people pour into town by the thousands, you’ve got to find something for them to do. That meant beer gardens, fish filleting competitions, knocking each other off poles over the water in the harbour, making sand castles, hosting a Viking village (I love the Viking village), creating a heritage display and sale at the local park, having pancake breakfasts, supplying Icelandic dainties. It all takes hundreds of volunteers. Volunteers work all year long to put on a four day festival. If they get any reward at all, it might be having lunch en mass with some Icelandic dignitary. Along with the volunteers, local businesses pony up money to pay for musical concerts. They often pony up a lot of money because the concerts are by top notch professionals. It’s ironic, in a way, that the year of Islendingadagurinn’s 125 anniversary, there is a problem with financing. I guess there’s always been a problem because there’s no way of charging all those thousands of people who come to have an Icelandic experience. Here, on Vancouver Island, we have the Saanichton Fair. It’s a knockout agricultural fair. However, it takes place in the country on fenced in grounds. You pay at the gate for the day or for the weekend. No one minds. We all line up and push our money through the ticket seller’s window and get our hand stamped. We all know that events have to be financed. To me, although I left Gimli in 1957 to go to university and have lived away ever since, coming back in the summers, Islendingadagurinn is Gimli. It’s Gimli’s heart. It’s Gimli’s identity. But it is more than that, otherwise, it would just be a small town festival. It’s at the heart of the Icelandic North American community. It’s a public expression of who we are. I write from half a continent away at a time when the Gimli park is deep in snow, the temperature hovers around -35, the choice of Gimli as a place to create New Iceland, is highly questionable, but the snow will melt, the air will warm, summer will come. Many of us will travel great distances to participate in Islendingadagurinn, even though it may be called something else. For those of us raised in Gimli, the celebration will always be Islendingadagurinn. The Icelandic flags and the Fjallkona in her robes representing the Icelandic landscape will always be with us. It has taken tremendous dedication and hard work to preserve this celebration of our history and culture for 125 years. I hope that those who have taken on the task today find a way to finance Islendingadagurinn for another 125. There is no road in the world more important than the road home. When I was young, I spent a lot of time in Winnipeg with my grandparents but I always knew that the day would come when my grandmother would take me to the bus station and put me on the bus. The bus would back out of its stall and there’d be the smell of exhaust and the soft, bristle feel of the blue bus seats. In those days, WWII was still on or just finished and a military mentally had, over six years of war, seeped into every aspect of our lives. Bus drivers were like Sergeant Majors, making everyone line up in January cold outside the bus, taking our tickets at the bus door, letting us onto the bus one at a time. It didn’t matter how cold it was, how hard the wind blew, how little a kid was or how many kids a woman had with her. Few people had cars in those days and we were packed into bus. Sometimes, the driver had to set up camp stools in the centre aisle. I always tried to get a window seat. I sat there, my nose pressed to the cold glass, my breath frosting the glass, taking pictures in my head, memorizing the landmarks of the road home so that if, some day, I had to return home on my own, I’d know the way. In winter, the ride was scary, the bus wheels crunched over frozen ice and snow, the streets of Winnipeg were piled high with ploughed snow, even in early afternoon, the sky was dark, clouds pressed down, snow drifted before the wind. We stopped, from time to time, to pick up passengers who were huddled against anything that would shelter them from the wind. The door would open with a whoosh, people would stamp their feet on the steps to break off the clinging snow, the driver would have gone outside so he could put their suitcases and boxes into the luggage compartment under the bus, then he’d get on and the door would swing shut with another great whoosh, the motor would rev up and we’d pull away from the curb. There were city lights, house lights, commercial building windows, but then as we reached the edge of the city, we plunged into darkness. The snow drifted more heavily, the houses were further and further apart, the graveyards were filled with drifts with only the tops of the monuments showing, fences were barely visible, houses appeared in window lit clusters, the houses of strangers who might or might not, if you knocked on their door needing help, open them. The road to Selkirk led through Lockport, a marker past, then Selkirk itself with its looming brick mental hospital. From there the farmer’s fields, the uncultivated forest, were swept by wind, covered by a frozen sea of drifting snow. The trees stood up like iron. We turned away from the highway to places like Dunnotor, stopping to let people off at Ponemah, Winnipeg Beach. Cold had shrunk the houses, snow had buried them. People took their suitcases and boxes and disappeared into the darkness over roads whose sides were piled high with ploughed snow. Home was closer now. If anything terrible happened, if the bus broke down, if I got off at the wrong place, I was closer to home. It would be easier to find my way. We stopped at crossroads where people climbed down and disappeared. Seats now were empty. There was the sign for the Lutheran summer camp, then the sweep of marsh and beyond it, Lake Winnipeg. Then there was the hospital and the turn onto Centre, the wheels squealing on the dry snow and there, my head bobbing, my eyes searching, was my mother large in her winter coat, waiting. I had to hold onto the safety bar climbing down the steps and had to jump from the last one onto the packed snow. “How was the trip?” she always asked. “Fine,” I always said but there, behind my eyes, was every landmark that would lead me home, just in case. I might walk for long stretches as the sun fell toward the west. In later years, I traveled new roads home, from Riverton, Snow Lake, Pinawa, and then, in a crazy grab at a dream, graduate school in Iowa and back, along Highway 75, roads through hills covered in corn as far as the eye could see, down into Minnesota, around Minneapolis, through a landscape full of silos, through small towns with church spires, past houses that seemed they should be on the cover of The Saturday Evening Post. Down to a border with rituals I had not known and through a southwestern Manitoba I’d only heard of in school lessons. And then, and then, the impossibility of four years in southern Missouri, its magnolia, redbud, persimmon blooms, its soft accents and watermelon fields and each year when the nights remained stifling hot, we went north, north to home, away from cherry coke and pecan pie, toward a remembered dream. We watched the landscape go by, sorgum fields, the pecan groves, the small farms of intricate, decaying houses, and then through Iowa again, hills and corn, and the lakes and forests of Minnesota. We knew when we arrived in Winnipeg and I began to count the landmarks of my childhood that our trip was nearly done. And, once again, we watched intently, calling out the markers that led us home and turned finally into Gimli and stopped in front of my parents’ home first for we knew there people were waiting, watching out the window for when we would appear. My mother first, scooping up the grandkids, hugging all of us and my father, trailing right behind. We finally settled in Victoria, not planned, a five minute phone call, a loaded trailer, crossing through Kansas, Colorado, Utah, Washington State, a road never to be traveled again, and now the road home was stretched, the sixty miles from Winnipeg to Gimli, turned into two hundred times that, every year the ferry across the ocean, over the Rockies, through Banff, the slow progress through the centre of Calgary, the big sky, the rolling hills, sometimes the antelope, Medicine Hat, Swift Current, Moosejaw, Brandon, always pointing home. I know these markers now as well as I did the ones of childhood from Winnipeg to Gimli. After thirty-eight years of driving home from the great West Coast and driving back, I need no map. What is home? Nowadays, no one waits to greet me as I arrive. My parents rest with my brother and grandparents in the graveyard north of town. No hugs or news. No pot of tea upon the kitchen table, butter tarts or vinarterta. In the house where I grew up someone else lives now. Many of my high school classmates have spread across the world or died. Home, I think, is a place, a history, a familiarity, but most of all, people, open doors, intense interest in each other’s lives, happiness in reconnecting, perhaps the life we shared when life was at its most intense. Perhaps it’s just a habit for some of us, this coming home from distant places but in Islendingadagurinn, in the Gimli Park, at the foot of the Viking statue, on the dock, along the beach, eating fresh pickerel fillets, visiting those who have stayed, or returned to live, or to visit, I find evidence of that thing called home. I had a revelation last Sunday. Nope, didn’t see Elvis in the Laundromat. Instead, I saw kids at Ruckle Park Farm Day. I saw, in two hours, what we need to do to pass on our heritage to our kids and grandkids. When I was editor of Logberg-Heimskringla, I constantly heard the refrain, “We’ve got to do something to get our kids involved in their Icelandic heritage.” It is not a new refrain. In 1960, when I was a university student, I sat in meetings discussing the same topic. That was 53 years ago. For me, over the years, that Icelandic heritage has been most apparent at Islendingadagurinn, the annual Icelandic Festival, in Gimli, Manitoba. 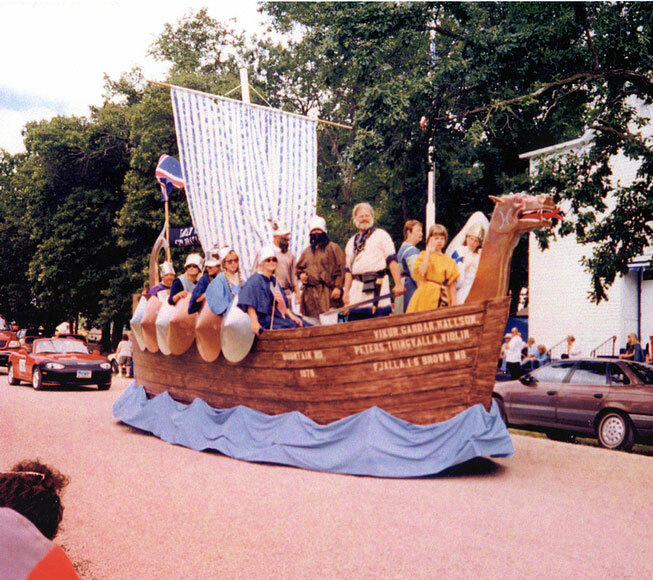 Although there have long been foot races at the Gimli community park and, in later years, a family sand castle event on the beach, and the Monday parade, there isn’t much to connect children to their Icelandic heritage. Part of the problem is that no one has ever defined our Icelandic heritage. Which is it that we celebrate? Is it just a Viking heritage? Has so little of value been accomplished in Iceland since 1066 that there is no heritage worth celebrating from that time on? If we are really only going to want to transfer on to our children and grandchildren knowledge of Viking culture, then we need to do more than buy them a plastic sword and helmet. The Vikings had a culture with many historic accomplishments beyond their being pirates. However, it seems to me, that there are a host of cultural facts and accomplishments from 1066 to the time when our great grandparents came to New Iceland that are worth celebrating and passing on. I think there are a lot of cultural facts and accomplishments to celebrate from the time our people left Iceland and came to Canada. 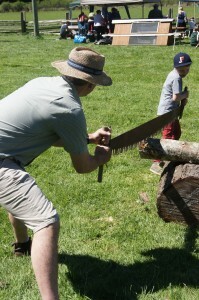 At Ruckle Park Farm Day I saw children actively involved in crafts and historic tasks. I thought, we could do similar things. Not just at Islendingadagurinn but at the Arborg Historic Village and the Icelandic Riverton Heritage project. What did I see that made me so enthused? 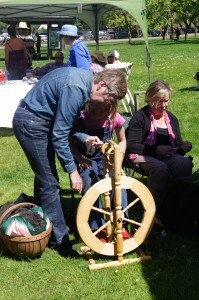 Well, first of all, I saw adults showing children how to card wool, how to tease it, how to spin it. Over the centuries, Icelandic wool and the products made from it provided a barter currency that allowed our ancestors to obtain the goods they needed to survive. It also provided them with clothes in a hostile climate. These skills I saw being passed on were critical for Iceland’s survival. 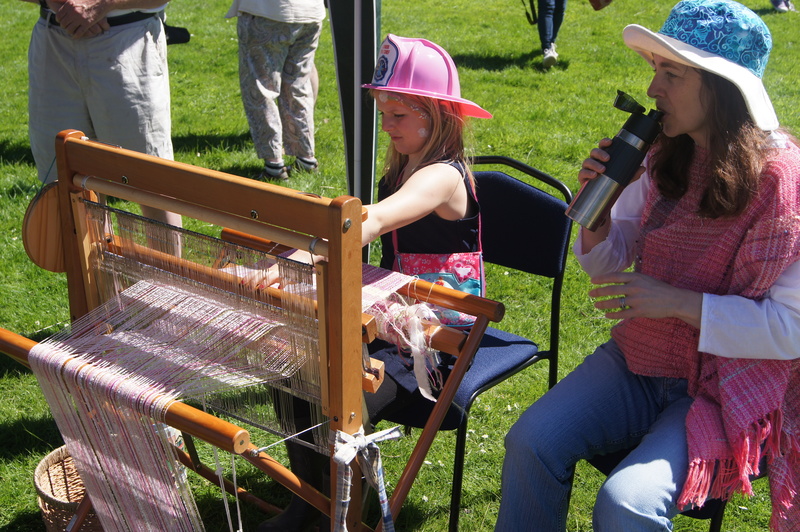 Surely, we, too, could celebrate this aspect of our ancestors’ culture by having displays and demonstrations and opportunities for young people to try out the various aspects of preparing and spinning wool. 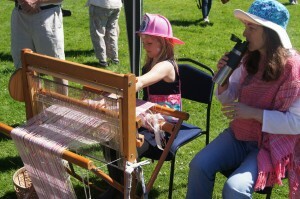 I also saw a young girl being shown how to weave. Our ancestors clothed themselves in a coarse cloth called wadmal. It was warm, hardy, valuable, so valuable that it was used in place of currency. Value of something such as a horse, or even a farm, could be determined by the ells of wadmal it was worth. I think these skills are worth demonstrating and teaching. I think the critical role they played is worth teaching. I saw logs had been set up ready for sawing with a two man cross cut saw. Cross cut saws were of major importance in the clearing of land and the harvesting of timber in BC. I saw kids cutting logs. I saw parents cutting logs with their kids. When the Icelandic settlers first came to Winnipeg, wood was still being used to heat buildings. Vast amounts of it were cut and shipped to the city. Icelandic men went from door to door offering to cut wood. It was even called the cordwood economy. Surely, this is worth demonstrating, teaching about, providing an opportunity to see what it was like to saw cordwood, although the saws used would likely have been the bucksaw or the Swede saw. There were displays of equipment with people to explain what tools were called and how they were used. How many people nowadays know what a shake maker looks like? Or how to use it? Or a butter churn? Shake makers weren’t used in Iceland but Icelanders operated on a butter economy. Butter, like wadmal, was used as a currency. There were blacksmiths at work. 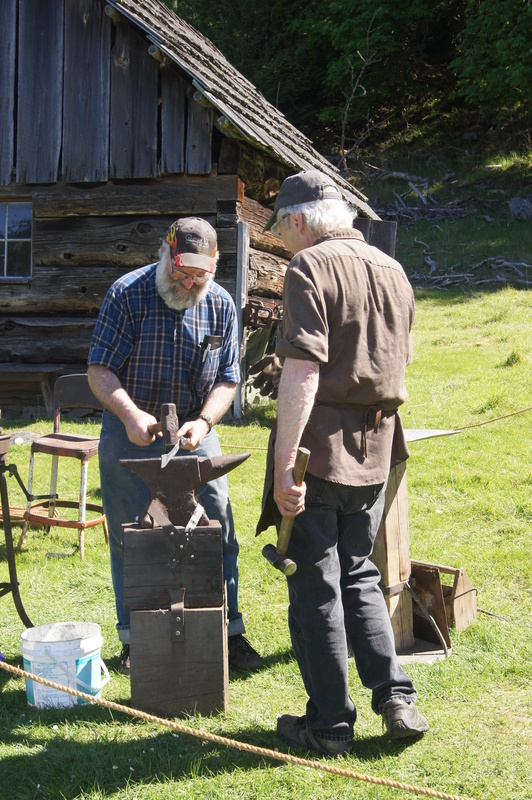 At one time, every Icelandic farm had a blacksmith. There were all those horses that had to have shoes. There were all those metal items that had to be made by hand. In New Iceland, the situation was similar but because people settled in villages and towns, there was a blacksmith for each town. These blacksmiths were critical for the function of daily life. Every farm in Iceland had a blacksmith. Every village in Canada. There were no displays of fishing equipment or its use since Ruckle Park Farm is just that, a farm producing fruit, grain, vegetables and meat. However, fishing was critical to survival in Iceland. Fishing also was critical to survival in New Iceland. Yet, there is little evidence of our involving our young people in our ability as fisher folk, either in Iceland or New Iceland. There is the Gimli museum, of course, and it does an excellent job but that’s not the same as getting kids involved outdoors in historic tasks. We could set up displays of fishing nets, etc. with an opportunity for kids to try tying on a cork or crimping a lead. That is, if anyone remembers how. We have a heritage we can be proud of. Our ancestors, both in Iceland and Canada, survived under the most difficult of circumstances. How they did that is a big part of our heritage. It is obvious that the Riverton Heritage project might be the best place to provide a day devoted to our New Iceland ancestors. It’s in the country, there’s a farm, there’s space for demonstrations, Icelandic sheep and horses could more easily be displayed, but some of these possibilities and others, should also be explored in Gimli and Arborg. 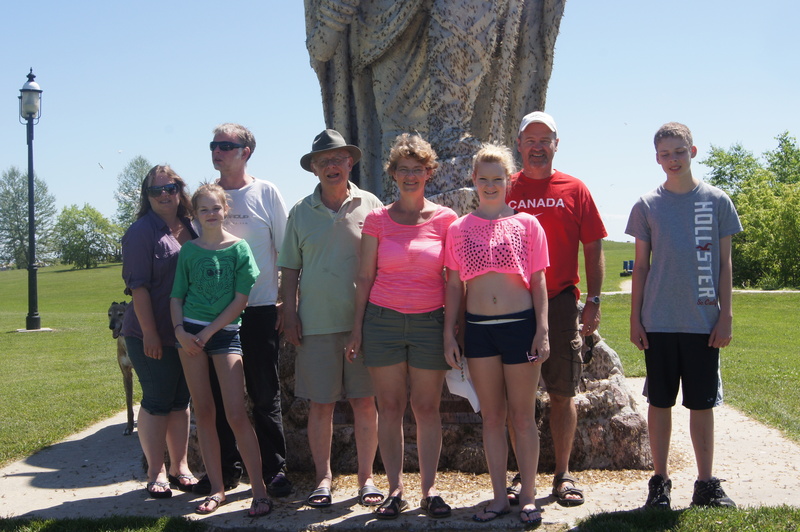 Each, Arborg, Gimli, Riverton, is and should remain distinct. I think what I observed on Salt Spring Island was the importance of having historic activities in which young people can participate, not just observe. Historic activities that are explained. If we don’t do something, a generation from now, our Icelandic Canadian heritage will be summed up by a kid with a plastic helmet with horns and a plastic sword eating a kleiner. Maybe that’s too optimistic. Maybe the kleiner will be gone and he’ll be eating a TimBit. Of course, it is easy to say this. Each demonstration, each display, requires a lot of work and, in some cases, money. Volunteers are often already stretched to the limit. However, time is running out. We still have a chance, maybe the last chance, to affect our ethnic future.